Source: Thanks so much to Skyscape and Two Lions for providing me with an e-ARC of this book via Netgalley! 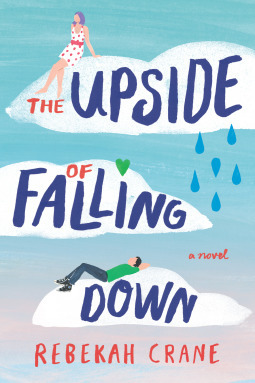 While scanning Netgalley for potential e-ARCs to read, The Upside of Falling Down captured my attention. It wasn’t just that adorable cover that drew me in, but also the intriguing premise- although I have noticed that many readers don’t tend to enjoy reading about characters with amnesia, I find it very interesting. Although I wouldn’t say that this book was the most realistic, I definitely enjoyed my time curled up with it. Reading this novel had me at the edge of my seat, not wanting to put my iPad down for any reason! The Upside of Falling Down follows a girl named Clementine, and she is the only survivor from a plane crash she was in. But things are not all sunshine and rainbows for her- she now must live with amnesia, remembering nothing from before the crash. Clementine decides to take this opportunity to become a whole new person, taking on the new identity of Jane. While in Ireland recovering from the plane crash, she meets Kieran, and he takes care of her and helps her adjust to her new identity. But not all is what it seems, and soon enough she finds her past and current identities clashing. Just as we’d expect from a protagonist with amnesia, Clementine, aka Jane, was pretty unreliable. She remembered nothing from her past, so she could not use past memories to help her make decisions and interact with others, leading her into a bit of a rebellious state. Considering her circumstances, I thought that this was 100% fair. After all, how can you be the same person you were before if you have no memory of being that way? I loved how the other characters in the story, especially love interest Kieran, were so supportive of Clementine, whether they knew about the plane crash or not. This made for a warm and welcoming environment for Clementine to adjust to as she recovered from her brain injuries, and I thought that this was great. However, I feel like there could have been a bit more conflict in terms of this, because I thought that the storyline was a bit fluffier than it should have been in a story like this. Even though extremely seasoned mystery readers may be easily able to predict the ending of this story, I feel like it was surprising enough to, for lack of a better word, surprise people! I must tell you that I was shocked, and I did not see any of that coming! Maybe I should pick up a finished copy of this book when it releases and reread it to detect all of the foreshadowing. In the end, I found that The Upside of Falling Down was a breezy and fun read. Though unreliable, the main character was tolerable, and the storyline was interesting and soared by quite quickly. If warm and fuzzy romance stories with fickle narrators tickle your fancy, then this book is definitely worth a shot! Do you enjoy stories with unreliable narrators? What is a book that has made you happy despite it covering serious topics? The concept does sound a bit too cute but very intriguing. Thanks for the review! You changed the look of your blog, right?? I really love it. This book sounds a bit too fluffy like you said but you wrote a very great review! That would be very pretty too! Great review! I’m glad you enjoyed this book! It sounds like a fun book to read.